Plyometric exercise is a great training method for building explosive strength, and because of which, it is often a form of exercise used by anyone from athletes to the military. Find out more about the Principles of Plyometric Exercises here. Most people could benefit for adding plyometric exercises to their fitness program, so if you’re not yet incorporating these types of exercises into your workout, check out the plyometric exercises below and add a few in. The front box jump is probably the first exercise that comes to mind when people think of plyometric exercises, and for good reason. 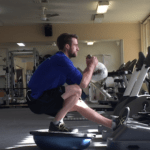 It is very a simple movement pattern and is very effective for working your quadriceps and glutes in the plyometric fashion. You can increase the difficulty of this exercise by either adding weight by using a weighted jacket or holding small dumbbells or using a seat. Adding a seat makes your legs have to work harder from the halfway position. Similar to the front box jump but as you might have guessed, jumping sideways onto the box. This is a great one to add to the front box jump as it incorporates your stabilising muscles of the adductors. Similar to the above, however rather than jumping upwards, you are jumping more lateral. This works the adductors more than the side box jump and it can be safer to add weight. This might wear you out more quickly than the side box jump, as there is less time between jumps and the added weight can help fatigue your muscles quicker. Another exercise to help build strength in your quadriceps and glute muscles is the skater jump. Like the lateral jump but this time, you are using one leg at a time to jump off. It is important to make sure you have a good amount of room around you. The distance you jump to the side largely depends on your ability. Also known as a jumping lunge, as you are essentially jumping from a lunge on one leg to the other. Resting between sets is important for most forms of exercise; this is particularly true for plyometric exercises, because to get the most out of each exercise you want to be able to exert maximum explosiveness. Take one-minute rests in-between sets. If you find this is not long enough, add an extra 30 seconds. Try to be as strict as possible with your technique and focus on safety first. Do not try to jump onto the biggest box, or as quickly as possible straight away. Start small and gradually increase the difficulty with your progress, and always within your means. Warm up correctly before going into plyometric exercises. Because the movements are all about explosiveness, if your muscles are not sufficiently warm and ready to respond you can easily cause damage and injury. Do some star jumps, spotty dogs, running on the spot until the legs muscles are awake and ready to act.